1. 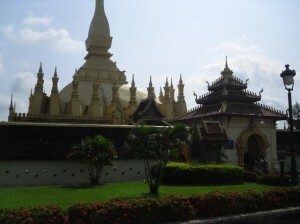 Laos is a very laid-back country. You can say it is the opposite of Vietnam. Even Siem Reap (Cambodia) is not as laid back. 2. Morning market here open at 10 a.m and close at 4 p.m. The same with most of the other shops. It is just 7 p.m yet you feel it’s already midnight! 3. One good thing, motorists here are better than their neighbour in Vietnam. No unnecessary honking. 4. The handicrafts they sell are a little bit disappointing. They haven’t fully develop their tourism industry. Having been to Thailand, Vietnam and China, I can spot a lot of items made there sold as local products from Laos (spotting Vinamilk (a brand of milk in Vietnam) and a shirt with made in Thailand tag, I doubt it’s the other way round). 5. But they definitely made a lot of effort in commercializing their city. They are developing the Mekong river and in the process of erecting a few more temples as tourist attractions. If you go to the countryside where a lot of these temples are located, the statement, there are more monks than tourists might be true. I overheard a local saying to a tourist that if a family member die, they have to become a monk for 7 days. One thing though, monks here are unlike the monks you usually saw in KL. monk here are quite fashionable & young. A few of them wear Ray Ban! (at least the three I saw). And monks here didn’t just meditate or walk around like we saw in KL. They do chores (I saw some mending the gate) in their orange dress! 6. Coffee is among the popular local produce. But for me Lao Coffee taste so much like Kopi Cap Kapal Api in Malaysia. 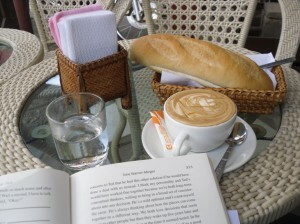 However step into the many roadside cafe and order a latte, it’s among the best I ever taste. Even better than Starbucks. At least equal to San Francisco Cofee if not better. French influence is pretty dominant around here. So, the pastries are quite awesome and available at a decent price (decent, not cheap). 7. One good thing, local here does not know how to cheat (you still need to bargain though)~ the usual tourists tax that you have to haggle your way out. But no blatant cheating like the trishaw rider in Saigon. 8. Laotian are generally polite although they will not bend over backward just to help you like the Thais. 9. Halal food is a little hard to find, however the city is not that big. 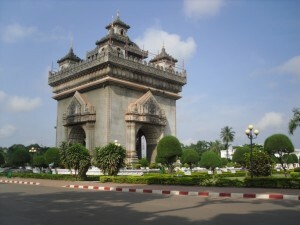 You can say it is quite easy to find and accessible (near the Mekong river).